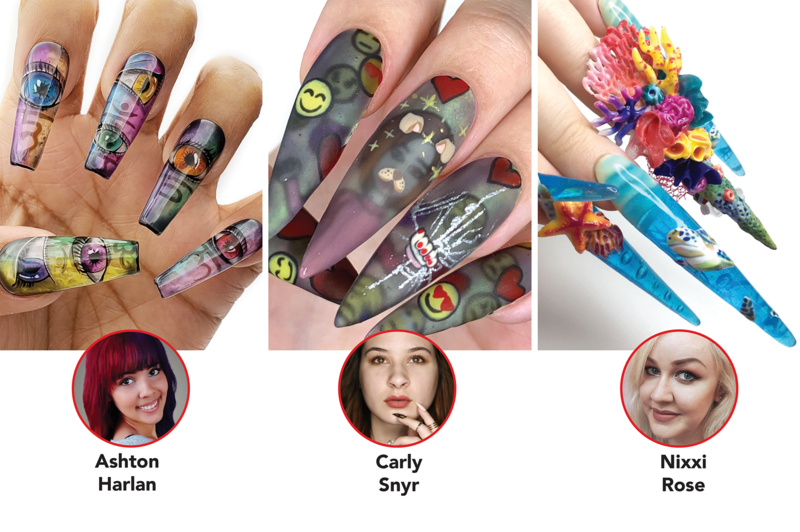 Challenge 3, sponsored by LeChat, asked our Top 10 to create a dual-sided design that peeked through the nail from top to bottom, using LeChat’s Perception line on an actual hand. This week’s guest judge was Anastasiia Morozova of LeChat. Ashton: We asked for jelly nails and that’s exactly what you gave us! This set exemplifies the transparency of the design, gradient technique, and a clear focus on the nails in the video. Nixxi: The judges praise you for your illumination of such a serious theme with exquisite artwork. Bojana: Your ghostly portraits were a hit with the judges, but the overall dark tones made for less pop with the jelly-like impact. Give more technique advice in your videos, please. Emily: The judges agree that your line work and use of color are two of your greatest strengths. They recommend mixing up the design more to show even more strength. The muting of the color, while befitting of the theme, did not sell the judges on the overall design. Also, watch the volume of the music in your tutorial. Kelsey: There’s no question that your artwork this week carries an important message that is so well done. However, the look on the whole is overwhelming. Some editing of the design and cleaning up the edges of the text on the nails would help with overall presentation. The judges appreciate the meticulous amount of work and thought you shared this week. Lorna: This design felt minimal, but it carried maximum impact. The judges loved the flipping of the tips to hide flaws. What they would have loved to see more of, however, was hand painting. Ashley: Your theme was nicely done, but the judges craved more transparency in your final design. Your video also went too fast. Please slow down and teach your techniques for maximum impact. Jenna: We all know you’re an amazing artist, and the theme of perception vs. reality is definitely found in nature. However, the judges struggled to find that theme in your design, nor do they feel that these nails followed the challenge guidelines. Stella: Cute story and symbology, but we’re having trouble seeing the reality – everything seems to look like perception.